All hooks are different, is there any such thing as the best hook? Probably not. However, I found myself in the situation recently where I was getting hand cramps after so many hours of crochet. I was using the metal Susan Bates and Boye hooks, which I have literally been using for the last 12 years. They are good sturdy hooks, but I’m out to find the next best thing. It may well be that there’s nothing we can do to avoid repetitive motion injuries in the field of pattern designing and making, but I decided I wanted to try. There are affiliate links in this post, but only so that it’s useful to you, they don’t affect which hooks I tested. I have seen many reviews of many hooks touting their ability to sooth hand pain, and erase making injuries. I put a call out on my Instagram stories to message me if you had strong feelings about your hooks. I got many many messages (so thank you!) but with a lot of different answers, so how could I know what was really the best?! I was using the Crochet Armor - metal when I took these pics, oops! I set out to do a final rating of 6 of the hooks that were suggested, 3 metal, 2 plastic, and 1 wood, in a couple different sizes. This is in no way an end-all-be-all list, but I thought it was a good starting point. My favorite – spoiler! Are the Clover Armour Metal and Tulip Etimo. I created 8 metrics to rate each hook, with an explanation of the ratings below. As I said above, people like different things, I like a strong hook, some people like a more pliant hook. The reason I made the rating system is so that you can find the best hook for you! 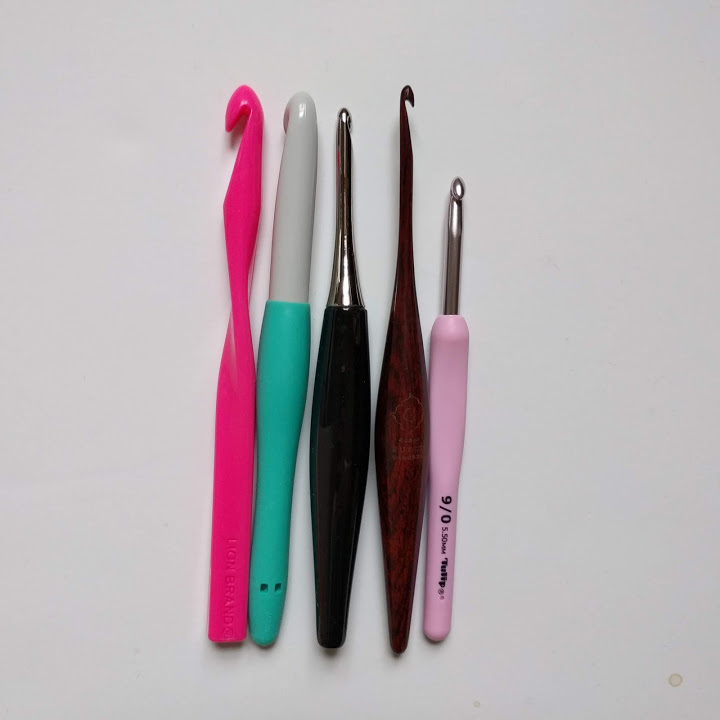 Aesthetics (how pretty it is): 1 - it’s a crochet hook it doesn’t need to be pretty, 2 - it’s average, 3- I would Instagram this hook alone. Flow (yarn friction, catches, or stickiness). 1 - it catches the yarn, 2 - it gets sticky in humidity, 3 - it’s impenetrable and the yarn scarcely causes friction against it. Ergonomic design (how does it feel in your hand? ): 1 - hurts my hand after a while (within one day after many hours) 2 - feels pretty good, 3 - feels amazing! Value for Money (I did this as well as cost, because I wanted to rate whether or not I thought something was worth it): 1 - the hook is not worth it 2 - the hook was slightly too expensive/ too cheap, but I still would buy it if it was the only hook in JoAnns’/ Michaels. 3 - worth it, properly valued. So there you have it! My full line up! I used the hooks with various different projects and fibers to make sure I tested them thoroughly. You may look at this list and think, how is the Furl’s Odyssey not your favorite? Well again, I wanted to rate the different aspects. A 3 is not necessarily the best for each person. I don’t care about packaging and aesthetics if the hook is not as functional. I personally thought the Odyssey was too expensive, and too heavy! My favorites were first, the Clover Armor and in second, the Tulip Etimo, because they were ergonomically designed (with Clover edging out Tulip by just a bit), cost effective (with Clover being just slightly cheaper than Tulip again), and they don’t catch on yarn or become sticky in the humidity. However, Tulip Etimo hooks are prettier, and you can get different color sets and metals! Surprises were the Furl’s Streamline and the London Kaye. The Furl’s Streamline hook looked so fragile I thought I would for sure break the tip of it right off, but the wood was sturdy and smooth, and a wonderful tool to work with. The London Kaye took a little getting used to because of the turn in the handle, but was great for larger fibers and I am definitely going to use it again for my larger fiber projects! A disclaimer - I do appreciate that you may love one of the hooks that wasn't best fit for me! This article is a tool that I hope helps people find a hook that feels great in your hands to help you make the greatest makes! If there is a hook you think deserves to be tested that isn't in this line-up, let me know! !